The Chartreuse Fire Dye minnow was practically glowing on the tube jig as I dropped it down beneath the ice in search of an aggressive splake. Cameras were rolling inches from my face as we attempted to film Pautzke Outdoors on a remote Northern Ontario lake. I was jigging the bait about two feet under the ice and within 10 seconds a streak of silver blew past. The splake swiped at the jig and missed. It then looped around, made another pass and inhaled the chartreuse minnow and jig. Thrashing side-to-side and spinning to try and get free, the action took place right under our feet! This is fairly standard when it comes to splake fishing. Splake offers anglers exciting action and is part of the Ontario Ministry of Natural Resources and Forestry’s stocking program. Splake are a hatchery cross between brook trout and lake trout. They seem to combine the best of both species. They bring aggressive fish that are willing to bite and offer good table fare. For winter anglers splake offers adventure. Researching the stocking lists, finding the lakes on a map and figuring out how to gain access is an adventure on its own. It gives a sense of satisfaction when walking out on a new lake often with little to no angling pressure on some of the remote ones. The OMNRF produces stocking lists annually. They tell anglers the lakes they put fish in and the numbers they stock. From this anglers can choose where they want to fish based on these numbers. Depending on the size of the water lakes are stocked with anywhere from 100 to 10,000 fish. Meanwhile, lakes of all sizes can provide good action. Some provide trophy opportunities. Splake are an interesting fish. They can be found in the shallows where you would find brook trout or in deep water where you target lake trout – and anywhere in between. Generally, I pick somewhere in the middle and set up in 15-20 feet of water. I tend to do best off of points and reefs or some kind of structure. In Ontario we can run two lines each when ice fishing. I typically have a jigging line and set line. For set lines we run live Pautzke Fire Dye minnows. This allows us to use live bait, but with the added color, flash and attraction Fire Dye offers. When jigging I favor any variety of white tube jigs, jig flies or jigging spoons, like a Hopkins. I’ll tip these baits with a smaller live dyed minnow or even a Fire Brine dead minnow. At the end of every ice fishing trip we save our minnows (that didn’t make it) and soak them overnight in Fire Brine. Doing this doesn’t waste any bait and is the perfect bait to tip jigs or spoons with. 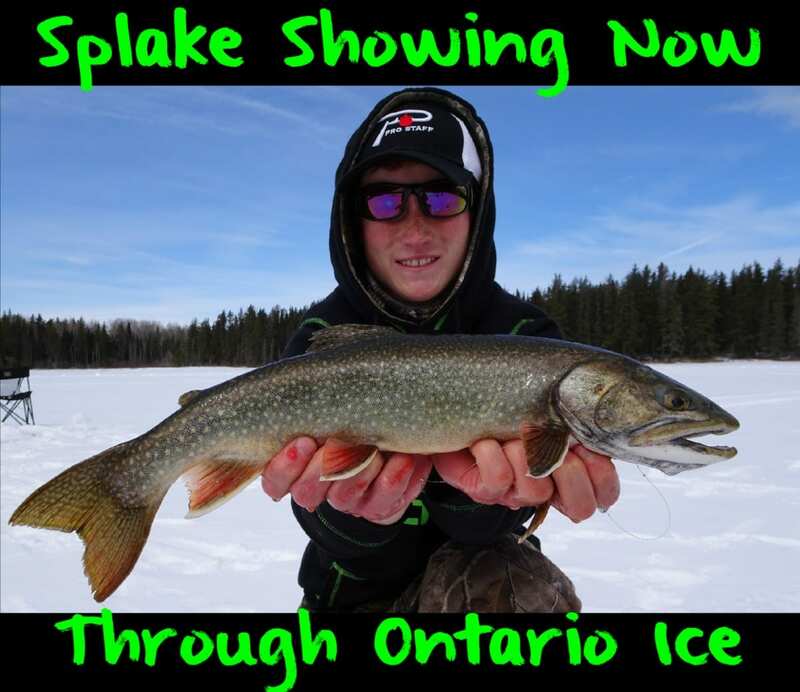 Here’s a link to the last two splake videos we filmed in Ontario with Pautzke Outdoors. You can see exactly how we rig with the minnows.